Begonia tubers produce flowers in many colors and work well in garden beds or containers in partially shaded areas of the yard. Tubers require different temperatures at various times throughout the year. Tubers bloom approximately three months after planting. Some gardeners choose to start tubers indoors about eight weeks before the last frost date to get a head start on flowering. 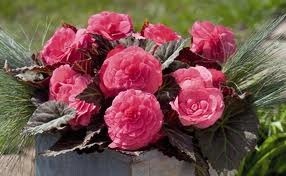 Once planted indoors, begonias need to be kept at a temperature of 70 degrees F to grow properly. Soil temperatures should be a minimum of 60 degrees F before planting tubers in the ground outside. 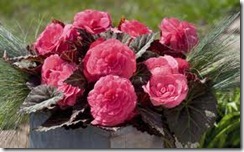 Tuberous begonias grow outdoors until the first hard frost, performing best in temperatures of 90 degrees F or less during the day and between 55 and 60 degrees F at night. The foliage then dies, at which point the tubers should be dug up and stored over the winter. Tubers need low temperatures of 40 to 50 degrees F during winter storage. Tubers left in the ground will freeze and fail to bloom the next season.